Flower photography should be so easy - beautiful flowers, a camera, and a photographer. All the elements required for stunning pictures of flowers. And yet, sometimes those flowers just don't seem to have the same magic in print as they did in the field. Here I show you how you can make your flower photography really do justice to those wonderful blooms! 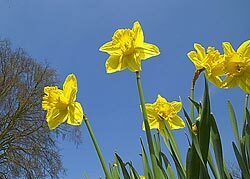 The slideshow above is of some daffodils. I deliberately took photos of the same flowers, but in three different ways, to illustrate how the way you take the photo matters. As a starting point it makes sense to get properly prepared to take flower photographs. Ok, so a few of those sound a bit obvious, but let me elaborate. Some flowers - a flower picture without any flowers is a bit pointless, but think just for a moment. Are the flowers you are aiming to photograph in full bloom yet? If not, wait a few days. Are the flowers looking past their prime? If so, buy some more, or photograph some others. A camera - but not just any camera. 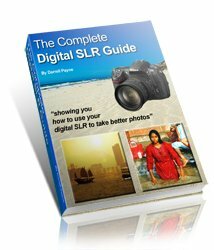 Your flower pictures will benefit from a camera that allows you to control the aperture. Click to read more about controlling a camera's aperture. Also have a look at how the aperture can be used to control depth of field. Sunshine - Not trying to be funny, but everything tends to look better in sunshine! Time your flower photography to a sunny point in the day if possible. Clothes - for great flower photos you will have to get down and dirty with the flowers. You'll be perfectly safe, as luckily they don't bite! 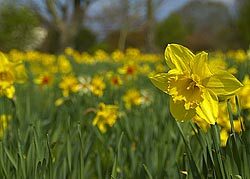 Back to the Daffs . . .
As I said before, I wanted to photograph the same flowers in three different ways, to illustrate some flower photography techniques. In this picture I wanted to focus on one bloom only, and blur the background. This makes that one bloom the thing the viewer focuses on, and makes a more powerful flower photograph. In order to achieve this you need to be able to control the aperture (and consequently the depth of field) on your camera. For more detail on how this picture was taken (including how it was processed using software), click here . In this picture I wanted to have an unusual angle. This is the photo where you need to get down and dirty with the flowers! The important thing here is to train your eye. Take the time to look at the world from unusual angles, and you will begin to see many creative opportunities. Finally, with flower photography, it's good to sometimes capture a whole field of flowers. 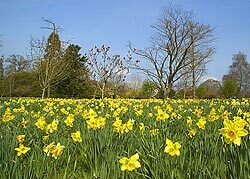 I wanted to emphasise the extent of the field of daffodils. This is another time to get down and dirty with the flowers! To really capture the extent of the flowers you need to get down low to give a greater feeling of depth to the photo.